Collaborative ‘cobots’ creator Rethink Robotics shuts down « Adafruit Industries – Makers, hackers, artists, designers and engineers! The Verge posts that Rethink Robotics, the Boston company that pioneered the development of “cobots” —collaborative robots designed to work alongside humans — shut down on Wednesday. Rethink was founded in 2008 by Rodney Brooks and Ann Whitaker. 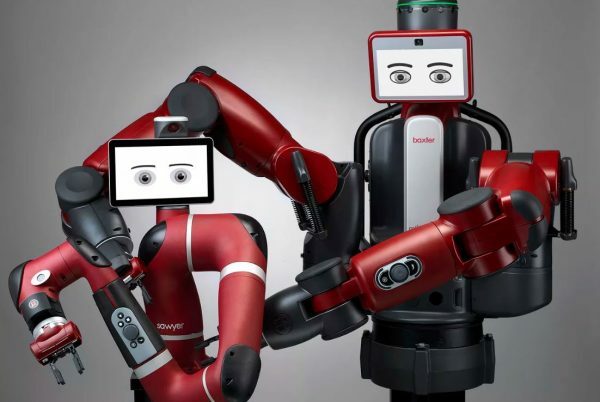 It introduced its first product, the Baxter robot, in 2011; followed by Sawyer, a smaller, faster version, in 2015. The robots were intended to usher in a new age, where machines would work safely next to humans, rather than confined to their own sections on the factory floor. Rethink will now be selling off its intellectual property and patent portfolio, with 91 employees let go. The company is the second major robotics firm to close in recent months, with Mayfield Robotics, makers of the social robot Kuri, shutting down in August.